We have all faced the conundrum of having too many meetings to attend and not enough time in our day. Saving for retirement and planning wise financial investments is necessary for long-term wealth building, but how would we find the time to schedule yet another appointment with a financial advisor? If you aren’t tied to the prospect of a face-to-face meeting with your professional financial advisor, you might not mind receiving robo advice instead. Robo advisors are quickly flooding the market with their algorithmic trading and online investment opportunities. Where it once required quarterly meetings with representatives and detailed discussion of your current goals, robo advisors can now rebalance your portfolio, control the allocation of your assets, and track your progress toward your goals with just a few clicks of the mouse. Online investment companies are cropping up everywhere, but how do you know which ones are legitimate? When it comes to choosing portfolio management software, AdvisoryHQ is here to help. In our top robo advisor comparison below, we are going to provide a complete listing of the top-rated, results-driven, and best robo advisors available in the industry. Why have robo advisors suddenly surged in popularity? The very best robo advisors have been around for a number of years, but people are finally starting to take these online investment companies seriously. Perhaps the answer lies in the fact that the numerous benefits of robo advisors have finally been brought to light. Robo advice is based around algorithmic trading, devised from a Nobel-prize winning formula. This type of robo investing software allows you to consistently tweak and customize your online investing to meet your long-term financial goals and your short-term investment strategy. From your risk tolerance to your online investing needs, robo advisors are highly technical and skilled at developing an investment plan specifically for you. The fees associated with robo advisors (especially the top robo advisors) are the other biggest draw for consumers and individual investors. Traditional financial advisors may charge anywhere between 1 and 2 percent. In a robo advisor comparison, you may be looking at fees of just 0.25 to 1 percent for online investment companies. The top robo advisors are also responsible for consistently rebalancing your portfolio. Financial advisors offer the same services, but cannot do so with the same regularity of robo advisors. Robo investing monitors your investments, and when the sell price dips, they automatically sell them for a capital loss, replacing them with similar investment types. If you still love the idea of having personal interactions with a financial advisor, you may be able to find that from some of the top robo advisors. Many online investment companies offer their clients access to a team of live financial advisors along with their investment software. Questions concerning the robo advice you receive can be directed toward a live person instead of an impersonal “frequently asked questions” page. Online investment companies, with the use of robo advisors, are on the rise, and for good reason. In this list of robo advisors, we will detail the advantages of the top robo advisors in a side-by-side robo advisor comparison. Below, please find a detailed review of each robo advisor on our list of top robo advisors. We have highlighted some of the factors that allowed these best robo advisors to score so high in our selection ranking. With sophisticated investing technology and a focus on efficient investing, Betterment offers an easy-to-use robo investing platform that allows their users to create investment strategies of their own. Founded in 2010, Betterment’s founders wanted to create a user-friendly portfolio management software program that allowed average people to start online investing with confidence. The result ended up being one of the best robo advisors available, not necessarily because of low commissions, but due to the technology that it can offer to its users. How has Betterment earned so many positive robo advisor reviews? See below for a few of the creative solutions that Betterment has to offer when it comes to online investment strategies. When you invest with a robo advisor, you would expect that your portfolio would yield higher returns than you would as a do-it-yourself investor. As one of the top robo advisors, Betterment knows this all too well, integrating high levels of technology to provide intuitive investment software. First, you can sync all your outside investment accounts into Betterment’s framework. Doing so allows the portfolio management software to monitor the overall view of your financial status and investment allocation. Once the robo investing software can view other assets, it can make suggestions that make more sense for your complete financial picture. The ability to analyze your overall financial health is key to making wise decisions when it comes to robo investing. Second, it allows you to create clearly defined goals that allow robo advisors to make better decisions regarding your investments. Whether you want to save for a rainy day, retirement, or a down payment on an upcoming home purchase, Betterment’s robo advisors can help manage the risk of your portfolio alongside your financial timeline. Third, the portfolio management software automatically reinvests your dividends and rebalances your portfolio when you make a deposit. As one of the best robo advisors, Betterment’s algorithmic trading keeps tax penalties in mind. Rebalancing is evaluated daily, and the investment software will even use leftover funds to purchase fractional shares so that every last penny of the money in your account is reinvested. 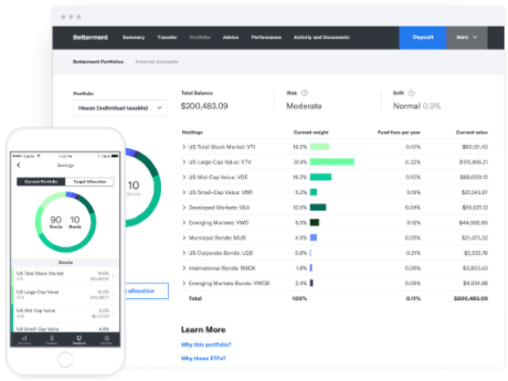 Betterment’s affordable pricing scale is one of the biggest draws of the portfolio management software, solidifying its place on the list of the best robo advisors. Fees for their online wealth management are split between two plans: Digital and Premium. Investments within the Digital plan will have an annual management fee of 0.25 percent, which falls far below the national average of 1 percent. There are no fees for accounts with a zero balance, and investors can stay within the Digital plan for as long as they would like, regardless of their total account balance. Investors that choose the Premium plan will have an annual management fee of 0.40 percent. To be eligible for this pricing structure, investment accounts must be at least $100,000. 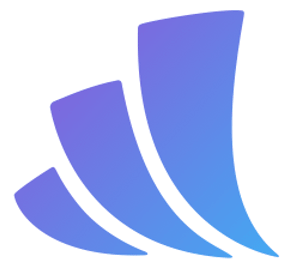 Betterment offers simple asset allocation and low management fees that are ideal for helping new users manage their online investments. Their simple, easy-to-use interface offers all the features needed to manage investments for a low fee, marking Betterment as one of the best robo advisors for investors of all skill levels to use. Betterment’s pricing structure is among the best in the industry, earning their online investing services a 5-star rating. Backed by a council of scholars and finance experts, FutureAdvisor is continuously refining their robo advisors and their knowledge to make wiser investment strategies for their clients. They have several award-winning investment professionals on their team, as well as wonderful engineers and finance professionals to help invest in long-term portfolios. For this top robo investing platform, the goal is to provide objective advice, which is the best option when it comes to investment strategies. To see what makes robo advisor reviews of FutureAdvisor so positive, we’ve detailed a few reasons why this portfolio management software landed on our list of the best robo advisors. FutureAdvisor creates a combination of objective advice, diversification, tax efficiency, and low-fee index funds to maintain successful long-term portfolios for their clients. As one of the top robo advisors, FutureAdvisor’s software does a little bit of everything: rebalancing your accounts, evaluating tax efficiency, and managing multiple accounts. After creating your personalized account that considers your personal risk preference, an online investment with FutureAdvisor is available through a third party. Your assets are held with either Fidelity or TD Ameritrade. However, because your accounts are all managed in one location, the investment software can make wise online investing decisions on your behalf by monitoring all assets at the same time. This allows FutureAdvisor to select an ETF that fits best in your portfolio. Like several others on our list of robo advisors, users can also manage several different types of accounts to reach their goals. Save for college, retirement, or a rainy day by selecting which goal suits your needs the best. Another feature that makes FutureAdvisor one of the top robo advisors is their fee structure. Receiving retirement advice is free after you make an account and fill in your personal information. Beyond this, you can expect to pay an average cost of 0.65 percent annually for Investment Management services. This typically covers their 0.50 percent management fee, fund expense ratios, as well as any necessary trading commissions. While more than 90 percent of the funds are commission free, accounts may still be charged with trades executed on Fidelity or TD Ameritrade. If you decide to discontinue robo investing service through FutureAdvisor, remaining investments return to your control, and you can decide how to proceed with your online investing as you see fit. One of the biggest advantages offered by FutureAdvisor is the ability to receive retirement advice free of charge. This is a great way to try out robo investing before transferring assets over and committing to full online investing services. However, it’s worth mentioning that the complete version of FutureAdvisor does have higher fees and fewer tools than competing robo advisors. Their asset allocation is also less flexible, earning FutureAdvisor a 3-star rating. Despite higher pricing and fewer tools, FutureAdvisor provides valuable robo investing services (particularly for guidance on retirement readiness), maintaining its spot among the top robo advisors. Founded in 1993, The Motley Fool is a multimedia financial outlet, reaching millions of investors through their articles, podcasts, books, newspaper column, radio show, mutual funds, and premium advisory services. One branch of these services is Motley Fool Wealth Management (MFWM) a largely automated portfolio management software. While Motley Fool Wealth Management services are currently closed to new investors, you may want to reconsider signing up for their waiting list, as our review found that investors would be better served choosing another option from our list of robo advisors. See below for an in-depth overview of why MFWM earned a 1 rating, and what the company can do to improve their ranking. Tax loss harvesting is a method of offsetting investment gains by selling investments that experience a loss. Many of the best robo advisors offer this service, but MFWM does not. According to their FAQ, this financial advisor online does not offer tax loss harvesting or tax location strategy for two reasons: first, because their portfolios consist of stocks that cannot be easily interchanged, and second, because tax loss harvesting temporarily leaves a portion of funds uninvested. While it’s possible that some portfolios may still see financial gains, robo advisors that do not offer tax loss harvesting are at a significant disadvantage, as more investors expect tax-efficient services. Understanding exactly how to sign up for Wealth Management services—and what requirements must be met—is nearly impossible, since the MFWM website does not directly address this. InvestmentNews reports that Motley Fool Wealth Management services are available only to subscribers of Motley Fool ONE, an investing newsletter priced around $7,500 for a one-year commitment. Paladin Research & Registry echoes this relationship between a newsletter subscription and wealth management services, which raises the question: why would potential clients need to visit third-party sites to get this information? More importantly, where is the value in signing up for a pricey newsletter service to earn access to financial advisory services? Without concrete information connecting the two, it’s difficult to tell. While MFWM does publicly advertise their annual fees in their FAQ section, their lack of transparency on eligibility and subscription requirements for their wealth management services reflects poorly on their services as a whole, solidifying their 1-star rating. Until Motley Fool can implement better tax strategies—namely, tax loss harvesting—and improve transparency, investors would be much better off choosing to invest online with another online financial planner on our list. As one of this year’s best robo advisors, Personal Capital is unique in that it is a hybrid financial advisory platform. Having access to a human advisor while investing with robo advisors is a great combination for a lot of consumers who are looking to open an account with one of the top robo advisors. For example, you might have financial planning questions that involve budgeting, developing a financial plan, buying or selling a home, planning for a newborn, planning for retirement, or developing a college savings plan for a child. For these questions, you’ll have access to Personal Capital’s financial advisors. In addition to providing an investment and financial advisory platform, Personal Capital also provides a highly advanced personal finance and budgeting software, increasing the value of their robo investing services. Based on its top-of-the-line software, Personal Capital was rated among this year’s Top Online Personal Finance Software by AdvisoryHQ. See below for more details on which factors landed Personal Capital on our list of the best robo advisors for online investing. For individuals who are uncertain about using robo advisors, Personal Capital can be an easy starting point, as their free financial investing and financial planning tools allow you to easily see and manage your entire financial life in one secure place. This makes Personal Capital one of the best robo advisors for new investors, making it easy to use portfolio management software to see a holistic view of your finances. Using Personal Capital’s software, you can easily utilize advanced graphics that allow you to monitor your cash inflow (i.e., income), cash outflow (i.e., spending), and the performance of your stock, bonds, and other investments on a single, easy-to-read screen. The robo advisors behind this investment software can calculate your personal net worth and help you create and manage a personal budget, ultimately allowing you to build up a savings. Don’t Miss! FREE Sign UP with Personal Capital and start tracking TODAY! When you register for Personal Capital, you’ll be provided immediate access to your dashboard. Using Personal Capital’s award-winning dashboard, you can easily link/consolidate all financial accounts (checking, savings, IRAs, loans, debt, credit cards, mortgage, home equity loans, etc.). Ultimately, they want their robo investing software to help investors reach their goals while recognizing that long-term holdings statistically have great success in fluctuating markets. When compared to traditional methods of online investing, robo investing with Personal Capital carries significantly lower rates than a financial advisor. See the image below for a quick breakdown of Personal Capital’s robo investing fees. In a robo advisor comparison, while Personal Capital’s fees for online investing may not be the lowest, many robo advisor reviews are quick to point out the high level of value that comes from their dynamic—and free—money management tools. For those who are just beginning to dabble in robo investing, one of the best questions to ask is how quickly you can gain access to your funds in case of an emergency. Personal Capital invests your money in liquid securities so that you can have access to it quickly. Withdrawal from your account should happen in just one to three business days. Not sure if you want to commit to their robo advisor yet? If you aren’t sure about committing to robo advisors, you can always sign up for their robo investing platform free of charge, just to browse through their various tools and options. Personal Capital is an easy-to-use, streamlined site for online investments, providing users with the advantage of seeing the “big picture” of all their finances in one place. Its free investment checkup and intuitive reporting features are big pluses, and these features are supported by Android and Apple devices across the board. Perhaps the only potential issue that consumers may encounter when using the Personal Capital robo investing platform is the high account minimum. To use the investment software, users must have at least $100,000 to invest, which is a significantly higher requirement than competing robo advisors. Although the high minimum investment amount could be problematic for some investors, Personal Capital goes above and beyond when it comes to additional financial features, providing a wide range of free financial tools and software to support successful online financial planning. All in all, Personal Capital is one of the best online investing companies and offers an excellent, comprehensive method to manage all your assets in one location, earning this online wealth management company a 5-star rating. Vanguard has long been a well-recognized name in the investment industry, and it’s likely to stay ranked among top robo advisors for years to come. From purchasing individual ETFs to portfolio management software, Vanguard can do a little bit of everything. Vanguard runs its own funds at cost to help their clients to keep more returns with an expense ratio that is 81 percent lower than the industry average. Vanguard Personal Advisor is yet another service they offer to help their clients maintain long-term wealth building. Want to know exactly what ranked Vanguard Personal Advisor as a top option for online investment companies? We’ll look at a few of the reasons below. Set goals: An advisor will go over your personal financial details to help you identify what your goals are, what your risk tolerance is, and find out more about you personally. Create a plan: You will receive a custom financial plan from their team of advisors. Put it into place: Your plan is enacted, and you are as involved in the process as you would like to be. You can be completely hands-off, or you can monitor it on a daily basis. Track your progress: See how close you are to reaching your goals based on the performance of the plan. Rebalance: Like all the top robo advisors, Vanguard Personal Advisor will automatically rebalance your portfolio when necessary and revise your plan as personal changes arise. Perhaps one of the largest benefits of Vanguard Personal Advisor—and what makes it one of the top robo advisors—is that investors can easily access a live person for guidance and advice. You can speak with one of their financial advisors as often as you desire, which allows you to choose how involved you would like to be in the process. Vanguard Personal Advisor claims that their fees for robo advisors are significantly lower than the industry average, which hovers at approximately 1 percent. Instead, they charge just 0.30 percent of assets under management each year. Over a twenty-year time frame—and accounting for compounding—a Vanguard client would have approximately $96,000 more in their portfolio, which certainly makes a difference when it comes to investment software. 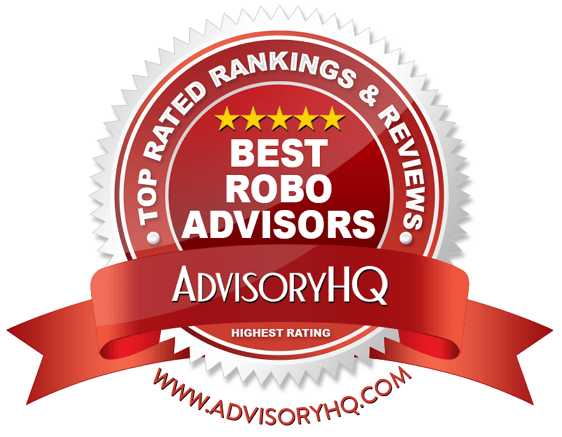 As one of the top robo advisors, Vanguard has a long history of success, and continues to be ranked highly among robo advisor reviews. Their annual fees are well below average, keeping Vanguard as a competitive option among the best robo advisors in the industry. Additionally, their focus on providing personalized service is a significant advantage, particularly when considering the hands-off nature of online investing. Although their $50,000 minimum investment is significantly higher than most, Vanguard earns a 5-star rating for their focus on affordable fees and personalized service, placing them among the top robo advisors in the industry. Wealthfront is a robo advisor service that takes the future of investments very seriously. Many robo advisor reviews—and, in fact, Wealthfront itself—consider their robo advisory services to be ideal for younger, millennial investors who are just beginning to explore the industry. By employing economists, mathematicians, data scientists, professors, and authors, Wealthfront can perform a wide variety of industry research, from behavioral finance to portfolio analytics to optimization. Doing so creates new strategies that their robo advisors implement to increase returns at low costs for their investors. You can find out more information on what landed Wealthfront onto our list of top robo advisors in the upcoming sections. Wealthfront assembles a collection of investments with their robo advisors based on modern portfolio theory, with selections ranging from domestic stocks to emerging markets, municipal bonds to natural resources. With a myriad of investment options through their diversification process, you can adjust a portfolio to your risk tolerance while remaining varied and tax-efficient. Additionally, Wealthfront’s robo advisors will combine behavioral economics research to identify your unique situation in just a few questions. Their portfolio strategy encompasses a collection of features called PassivePlus®, which includes tax-loss harvesting, direct indexing, and advanced indexing to promote tax-advantaged investments. One of their newest offerings, Path, is a fully mobile financial planning experience that allows investors to explore their savings, investments, spending habits, and retirement plans on-the-go. 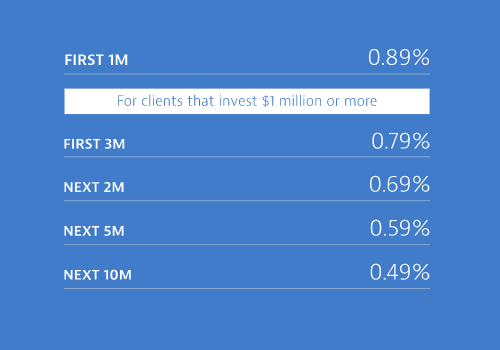 Wealthfront’s low fees make it one of the top robo advisors. You do not incur additional costs for trading fees or hidden fees, even as your portfolio is rebalanced. Additionally, the first $10,000 invested into your Wealthfront account is managed for free. Any investments over $10,000 will incur a flat rate of 0.25 percent annually, separated into monthly charges. The minimum account balance for Wealthfront’s investment software is $500, which strikes a nice balance of affordability for a wide range of investors. Even with higher robo investing balances, investors will still benefit from some of the most affordable fees in the industry, with $100,000 investments incurring an average monthly fee of $18.49. With a comprehensive suite of investment management services and an incredibly attractive pricing structure, Wealthfront is one of the most competitive online investment companies in the industry. Its features are advanced enough for experienced investors, while remaining accessible for newbies, making Wealthfront a great investment management company for a wide range of investors. Wealthfront provides investors with deep value through lower account minimums, affordable annual fees, and best of all, free account management for the first $10,000, earning this robo investing platform a 5-star rating. WiseBanyan proudly proclaims to value all clients equally, with a mission to revolutionize the robo advisor industry. Part of that revolution certainly comes from their commitment to providing accessible, valuable investing opportunities for all, regardless of investment amount.There are no annual fees associated with WiseBanyan, and no minimum account balance. For beginning investors, investors with lower balances, or investors who simply want a break from complicated fee structures, WiseBanyan is a great automated investment software to consider. With a combination of affordability and approachability, WiseBanyan has become one of the top robo advisors on our list of best robo advisors. Want to know exactly what ranked WiseBanyan as a top option for online investment companies? We’ll look at a few of the reasons below. Robo investing with WiseBanyan begins with asking questions about your individual investment preferences. Taking these preferences into account, your investment portfolio will be created by the WiseBanyan investment team, built to maximize after-tax, real investment returns. These portfolios are fully diversified through the Modern Portfolio Theory. This theory provides a framework for combing securities with the highest return possible. From that moment on, the investment process is fully automated. The robo advisor software at WiseBanyan will take care of investing funds, monitoring progress, and reinvesting dividends. Part of what makes WiseBanyan one of the top robo advisors is that they offer a wholly unique pricing structure. Rather than make money off management fees, like other robo advisors, WiseBanyan gives investors the option of adding fees relative to services that they want to use, employing an a la carte pricing system. Thus, the cost of robo investing with WiseBanyan will differ depending on which investment services you choose. These “premium” services, called Tax Protection and Fast Money, may add an extra fee to the robo advisor software, but the benefit comes from choosing extra fees, rather than paying for robo investing services you are uninterested in. By allowing investors to choose to pay for the services that they want, WiseBanyan is perhaps the most unique online investing service of all the top robo advisors on our list. This provides a fully customizable robo investing experience, giving investors control over their savings in new and exciting ways. Unfortunately, WiseBanyan could be more transparent in the way that they communicate their a la carte services, particularly when it comes to pricing. Specific information on individual service packages and annual pricing is difficult to find. This could easily discourage potential investors from signing up for their robo advice, earning WiseBanyan an overall 3-star rating. Robo advisors can make your investment opportunities substantially easier and yield greater returns than a do-it-yourself approach or a traditional financial advisor. Over the long-term, a robo advisor can add extra earnings into a well-diversified portfolio with extra savings from advisory fees. Although online investing has surged in popularity over the last few years, robo advice is still a relatively new concept. 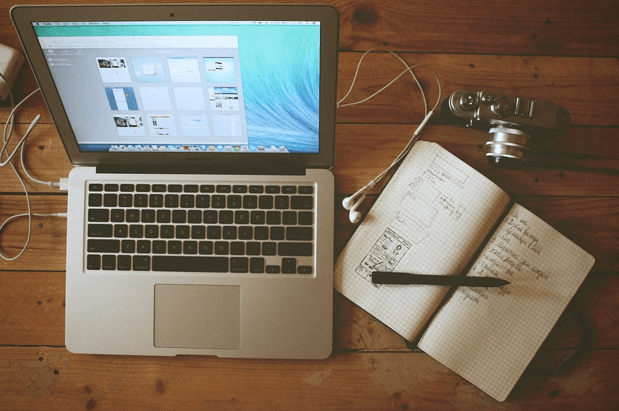 How much money are you planning on investing with online investment companies? What do you expect to pay in monthly fees or annual fees? Do you want a personal financial advisor included with automated robo advisors? No matter what your financial goals are, making the switch to robo advisors can be one of the best investment strategies to manage your long-term wealth. Looking at this robo advisor comparison and investigating robo advisor reviews can help you to increase your wealth, save for retirement or college, or to invest for an upcoming expense.